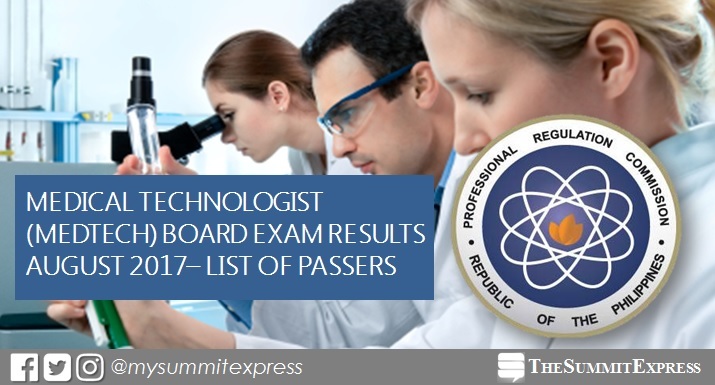 MANILA, Philippines - (UPDATED) The August 2017 Medical Technologist (MedTech) board exam results, which include the full list of passers, top 10 (topnotchers), top performing school and performance of schools are all available on this page as officially released on Thursday, August 31 or in three (3) working days after the exam. UPDATE: As announced, 4,821 out of 5,661 passed the exams. From September 6 to 13, registration for the issuance of Professional Identification Card (ID) and Certificate of Registration will be done on-line. Please go to www.prc.gov.ph and follow instructions for initial registration. Medtech board exam's verification of ratings (passers or RMT, non-passers and removal) can be done online. Medtech board exam covered the following subjects: clinical chemistry, microbiology and parasitology, clinical microscopy (August 26); hematology, blood banking and serology, hispathologic techniques, cytotechnology, medical technology laws, related laws and its implementing rules and the code of ethics (August 27). According to PRC Resolution No. 2016-1019, the target release date of Medical technologist board exam results is on Thursday, August 31, 2017 or in 3 working days after the exam. In the same period last year (August 2016), results were available after 3 working days. A total of 4,144 out of 5,126 hurdled the exams. Cagayan State University (CSU) - Andrews Campus, Cebu Doctors' University (CDU), Saint Louis University (SLU) and University of Negros Occidental - Recoletos topped the board for having 100% passing rate. In March 2016, results were also released after 3 working days. 2,046 out of 2,596 passed the medtech board exam. Adventist University of the Philippines (AUP), CSU-Andrews Campus and University of Baguio (UB) led the schools after garnering perfect passing rate.